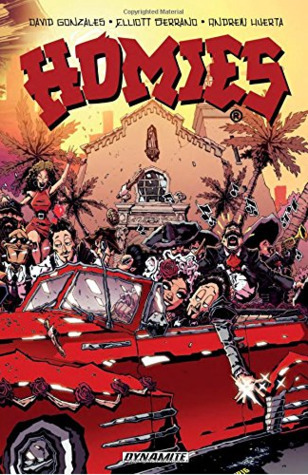 This entry was posted in Book Reviews: ALL, Default and tagged Andrew Huerta, Comic, comic book, Comic Book Review, Comic Review, Coming Soon, David Gonzales, Elliott Serrano, graphic novel review, Homies by Sarah "SacaKat" Fairbairn. Bookmark the permalink. A Pitbull song 😆😆😆😆😆 Pitbull jokes never get old. This actually looks really sassy and fun, kind of having that Walking Dead vibe but without the zombies obviously. The illustrations look super busy though, are they like that throughout the entire comic? The wedding images were big and dramatic, just like the wedding. The Artwork took some getting used to. At first I found the artwork harsh and violent on my eyes. I found I was scanning over the whole image and it was a lot to take in. The later stories have less characters in them so the images aren’t as busy. I didn’t like the first story, the man-whore groom swearing he’d found the one and was changing his ways, but hooked up with someone at his bucks night BLAH nope, nope, nope. The other three stories had lovely messages, so I really feel like I must have missed something in the first!